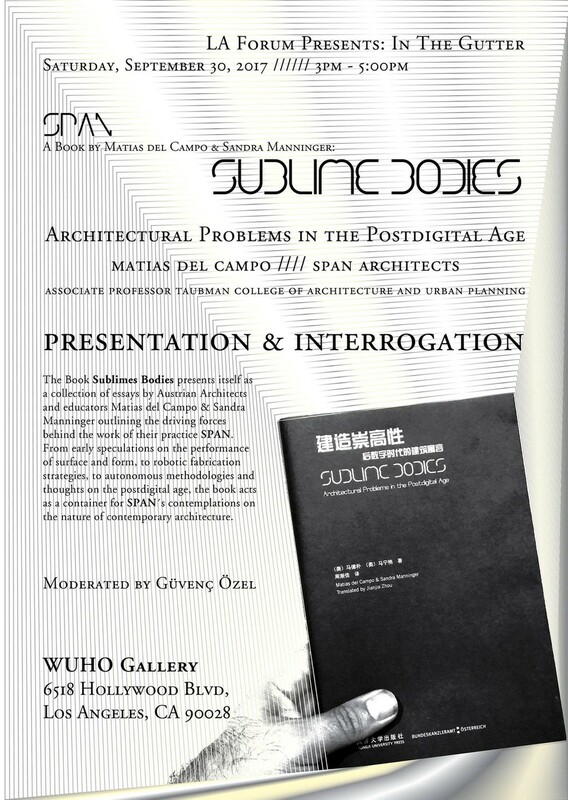 The Book Sublimes Bodies presents itself as a collection of essays by Austrian Architects and educators Matias del Campo & Sandra Manninger outlining the driving forces behind the work of their practice SPAN. The Book Sublimes Bodies presents itself as a collection of essays by Austrian Architects and educators Matias del Campo & Sandra Manninger outlining the driving forces behind the work of their practice SPAN. From early speculations on the performance of surface and form, to robotic fabrication strategies, to autonomous methodologies and thoughts on the postdigital age, the book acts as a container for SPAN´s contemplations on the nature of contemporary architecture. In same parts theory, report and manual the book investigates the relationship between historic lineage, philosophical inspiration, technological innovations and its effects on design strategies for the built environment. For SPAN the built environment encompasses a large range of various scales, from the design object to the urban conditions, all of which are bounded by rulesets of mathematics and geometry extracted from nature. The combination of speculative thinking with advanced design sensibilities and a profound curiosity for new technologies is what forms the dense design ecology of SPAN, outlined in this book.